Photo booth services have become quite popular in the past couple of years. Corporate events, private parties, product launches, and wedding gatherings use this service to capture awesome memories at the moment and entertain the guests attending the event. Clients pay between $700 to $1,500 to hire a reputed and experienced photo booth service on the market. Reputation is the key word when hiring the best wedding photo booth service to cover your big day in life. This article provides information on some of the most important benefits of hiring a reputed wedding photo booth service. First, you have to understand a wedding photo booth is not an alternative to hiring a professional wedding photographer to cover your big day in life. But you should not be confined to only hiring a professional photographer for your wedding. There is a disadvantage of such a move. That is when you hire a wedding photographer, taking photos is limited to only one person. On the other hand, a photo booth encourages spontaneity where your guests can entertain themselves and be creative in taking photographs using the booth. Your guests will have a better chance of taking memorable photographs via a photo booth compared to a professional wedding photographer. In fact, you should let the professional photographer capture big moments on your special day. But let your guests enjoy themselves capturing little moments via the wedding photo booth service. Your guests will find it more interesting and creative after all. This is why you need to pick the right photo booth service for your wedding. The latest open photo booth setups are more user-friendly. Your guests will not find high-tech gadgets that they cannot operate by themselves like in the past. In fact, the latest technology gives the opportunity to operate these gadgets through simple touch-screen setups. On the other hand, a majority of wedding photo booth services accompany an attendant who will help your guests with whatever technical issues experienced by them. Most of the time, the attendants will explain how the process works and keep your guests entertained throughout the event. Most of the time, guests who attend the event want to show their love and appreciation for the couple. But they have no way of doing it because they may not want to trouble the photographer. But when you have an open photo booth at the event, anyone is free to be creative and show their appreciation for the happy couple. Your guests will love the idea of spontaneity and freedom they get to enjoy with an open photo booth service. The booth will be available in the background of the reception area until the event is over. Hence, anyone can take a photograph of the couple at any time they wish to do so. They will not have to trouble the wedding photographer for this purpose. This is another advantage of hiring a wedding photo booth service for your big day. A wedding photo booth service offers the chance for every guest to leave a visible mark on your big day. These are the memories that would be cherished by both of your for years to come. On the other hand, the majority of photo booth services offer on-site printing facilities where your guests will get an instant copy of the photograph. Just imagine how happy they would be due to this simple gesture on your part. In order to enjoy all of the aforementioned benefits, you need to hire a reputable and experienced wedding photo booth service in town. With so many services operating in the area, how are you going to find a reliable provider on the market? The Internet is the best resource to do your research in this regard. Search Google for the best wedding photo booth service in town. You will get a list of photo booth services operating in the area for such a search. Check the websites of these services to know about the salient features and prices offered by the service provider. This way you could easily pick a reputed and experienced photo booth service for your special day. In conclusion, photo booth services are in vogue in this day and age. They are quite popular at weddings, corporate events, birthday parties, marketing promotions, and a variety of other events. 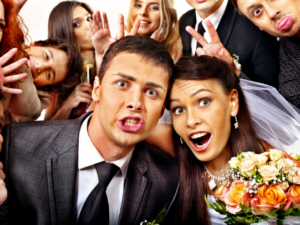 Photo booth services add a fun element to any large gathering. These services are quite affordable for the fun and entertainment they provide. Make sure you pick a reputable and experienced photo booth service for your big day. Finding the best service provider may not be easy with so many photo booths operating in your area. The aforementioned read offers information on what you need to hire a reputable and experienced photo booth service for your wedding. Long Island Photo Booth Rentals Company specializes in Long Island, NY for Weddings, Corporate Events, Sweet 16s, Birthday Parties and all other occasions.